Okay, this is getting embarrassing, but if you’ve ever wondered what my food storage looks like, or what my dogs look like, or what I look like, here’s your chance. The Fox News affiliate here in Phoenix aired a story last night about me, my blog, and preparedness in general. My main regret? That my Christmas tree was still up!! De-Christmas-ing our home is one of my least favorite chores, and the kids and I hadn’t finished taking down the big tree. Other than that, I thought Sandra Kotzambasis, the Assistant News Director, did a fabulous job of putting the story together. It wasn’t hysterical or condescending. What can I say? It was fair and balanced. I think it came out great! I'm so jealous of your home and your food storage room. They are both beautiful! I have those same metal shelves in my kitchen, though the shorter version. We live in a small mobile home. Our kitchen "pantry" is just a small cabinet. So, I invested in 3 (a little more than waist high) shelves from Lowes and they are wonderful! I even use part of the top as my spot to start seeds (growing light suspended above). They are very sturdy, look very nice and so far seem very durable. Just thought I'd mention all that in case someone was looking for some inexpensive shelves for their food storage. Try Lowe's! Thanks, Julie. We're very fortunate to have that extra bedroom. You're so creative, though, in figuring out how and where to store everything! Good for you! only out of necessity. LOL. I tell my husband all the time: when we finally get a place of our own with more room, even just a little, I won't know what to do with myself! LOL. 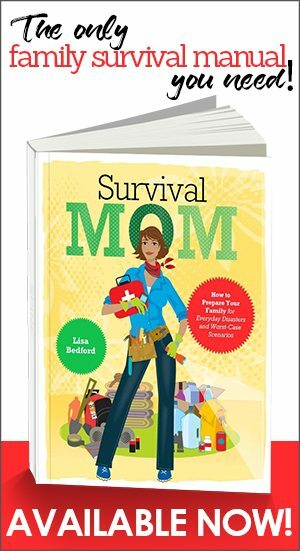 Hello Survival Mom! I saw your story on the news last night and though that it was fantastic! Thank you so much for creating a great site and making this information available to EVERYONE! I have a reputation for being 'prepared' amongst my friends and family. I try to promote a certain level of awareness among them, especially the Ladies. Too often, people go about their daily business in condition white, oblivious to their surroundings. You have compiled an amazing resource and presented it in a fun, family friendly way that makes it easy to share with others. I will tell everyone I know about it! Again, Thank You Very Much! Lisa, Very good interview. Fox was "Fair and Balanced." 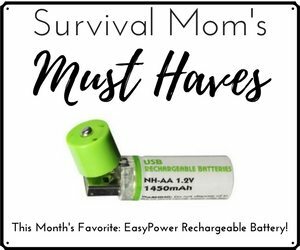 You came across as a typical mom who sees a realistic need. Thanks for having the courage to put a face on preppers! Your storage is impressive. We don't have a spare bedroom, but I sacrificed 2/3 of my walk-in-closet. My husband is installing wire shelving that mounts to the wall. (Lowe's!) We have a few more shelves to install; hopefully with his next paycheck. I also have shelves and cabinets in my laundry room that hold laundry supplies, toilet paper, paper towels, and cleaning supplies. Stockpiling takes some serious creative storage! First off, I want to say that your site and the info on it rocks! I am so grateful for the education, resources, and well-researched and thought out opinions you offer. I think I check your blog for new stuff once or twice a day. 🙂 That being said, as someone who appreciates you and what you do, I beg you to take a few minutes and think about how to protect your family and your 'preps' if something truly does happen besides the economic 'downturn'. I would hate to think that your reward for encouraging and educating so many people about something so important would be to have it all taken away because people now know what you have. You seem like a pretty smart chick so I'm sure you have plans in place but in case you don't…… I'm one mom whose family has benefited from your willingness to share, but I've also come to think I sort of 'know' you (I know that sounds wierd :-), and I'd hate for anything to happen to you and yours. Ladybug, every once in a while a reader sends me an email or writes a comment that just astounds me. To think that you, someone I've never met, cares about my welfare and that of my family, speaks volumes about the prepper community. There may be some preppers out there whose purposes and intentions are purely selfish, with no intention of sharing or reaching out to others, but I don't see that here at all, and especially not with readers like Ladybug. I know the blog and media exposure puts me out there on the radar, but the internet is filled with forums where people freely post every gun they own, how much ammo and in what calibers, and pics of their retreats and stashes of food. People with evil intentions will always manage to find a target, even if it means one who is well armed! I mentioned earlier the irony of preppers desperately needing to talk with each other, check their sanity levels, and ask for suggestions, but then having a bit of paranoia about giving too much information away! So, if my blog and these interviews help other preppers find each other and give an identity to the thousands of closet preppers out there, it's worth it to me. My husband is our family's security expert, not called the Paranoid Dad for no reason, and ultimately, God is our protector and defender. Thanks for caring. I can tell by your words that you've given this a lot of thought, and I appreciate that. Wonderful story!! Love the pantry by the way!!! Hopefully with stories like yours it will make others realize of the importance of prepping. 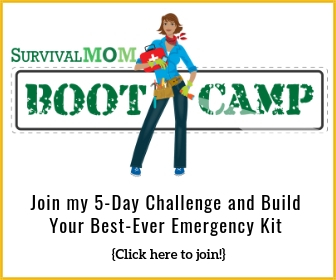 I am so thankful for your site as I am a new prepper. You were so right in one of your articles, this is addictive! I can't go into a store now without thinking about what I could use in my pantry! I just think it's especially important for my family, it's not just my husband and I anymore. We have a 4 month old baby to think of now, so we've been stocking up on diapers, wipes and formula. Also buying clothes several sizes to big, you never know when things can go bad in either the economy or environment! Thanks so much for your site again and may God bless you and your family! 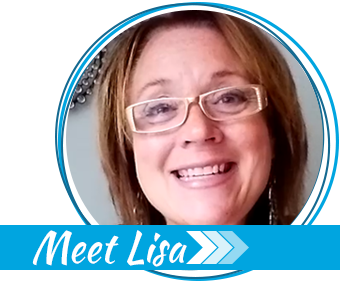 Nice work on the interview lisa. You are getting famous! Right now I just have a few medium 22 gallong size storage bins for my storage needs right now, might switch to shelving though. That was great! I recently found your blog – thank you for all the info. 🙂 I bought my first month's supply of food thie month. Baby steps for now! Wow! A month is pretty significant! Good for you! Very Well Done! Brava, Brava! Thank you! At first, I was going to put the dogs outside, but the cameraman said, "No, just let them do what they ordinarily do." Fortunately, what they ordinarily do is just nap, so it was all good! Great story….it ended and I thought "Wait!! I want to see more!!" Ok, I call on Oprah to give you a talk show. heehee. But you're so right….no one ever presented this from a woman's point of view. Someone had to say it out loud for it to click…but I guess that exactly the reason I took one look at the Newsweek story, which led me to this site, which has since turned my way of thinking 180 degrees. Thanks Lisa. You're doing so many stories and now "classes," how do you have time for all that? Whew! You know, I was a teacher and trainer for so many years that it is just kind of all coming together again but with a prepper twist, so to speak. I really have no intention of becoming famous, but when I have an opportunity to do something, I generally go for it. I've taught my kids that when they have a chance to do something, go for it, unless it's illegal, immoral or dangerous. Had to add that last one for my son, and my daughter is so naturally cautious that I wanted to give her encouragement to try new things but within some common sense boundaries. Thank you for your kind words about the interview. Great job! I am continuously learning new things from your website. I only wish I lived close enough to take advantage of your classes. You are doing a wonderful service, keep up the good work! Thank you very much. One of the nicest benefits to having this blog is getting to know so many nice people from readers to other bloggers to those in the preparedness industry. Thanks for the work you do on this blog. I love your suburban perspective (that is not a slam! )- I think it is more realistic that loading the AK 47’s on the pickup and heading off into the wilderness. I don’t think most of us would do that if we could. There is really a need for balance and sanity in the “prepper world”. Kristen, you are so welcome to embed that video or pass along anything on my blog. It has only been in the past 70 years or so that we Americans haven't had to give a single thought to survival, e.g. clean water, food, fuel, shelter, protection. Interestingly, it's also been during this time span that most of our advances in technology and medicine have occurred. Without having to focus on daily survival, we have more time to learn, research, invent, etc. Anyway, it is very interesting that we are seen as outside the mainstream since survival has been the story of humankind since the dawn of time. I'll enjoy browsing through your blog! Thanks for visiting mine! This is a GREAT video! I am known in the 'prepping' community as 'ReadyMom'. I have been openly promoting emergency home preparation for pandemic for the past several years and co-founded 'ReadyMoms Alliance'. We've attended many meetings on a national and local level to try to get community leaders to promote home preparation more aggressively. It's a loooong road to travel 🙁 . I have been giving open community presentations on this, and have a TriFold poster with photos of pantries from various people that I pulled off the web several years ago. Whenever I give my presentations, attendees are amazed at the pantry photos! I hope that your news report inspired others to have a heads up and realize the importance of home prepping! Lately, the focus has been trying to get households to prepare for the H1N1 (Swine) flu pandemic. Other considerations, besides food include Alternate Childcare, Medical Supplies, Flu Kits for College Students. Since we are expecting another wave of flu and there are so many who have NOT been vaccinated that could become ill, these preparations are important to put into place. If you are interested in any of that information for your readers just let me know. I'd be happy to share! I have a website which I like to refer to as my 'card catalog' of information on home preparation: http://www.EmergencyHomePreparation.org . I hope it can be of some help to some of your followers, as well. LOL I guess time will tell. At any rate, my family has the groceries and supplies they need if we're ever out of work for the, now, average of 27 months. I hope you can say the same for you and yours. Yep! There the blog was, loud and proud! Watch for my interview with The Arizona Republic in a couple of weeks. Great website! I also am a prepper, buy alittle extra every week, take advantage of specials. Buy a liitle gold ,or silver with a every paycheck. Keep little money in bank enough to pay bills, no credit cards anymore. Best place to hide money at home is a tampon box, there's not a man alive that will touch it. People need to be prepared for anything. I've given that a lot of thought, CZ. I've wanted to give a voice and a (normal) face to preparedness. I talk with people, both men and women, who think having a few cases of ramen and a pool filled with water, literally, is preparedness. Others are so stocked up on guns and ammo that their plan is just to steal whatever they need. Most people don't have a preparedness mindset, and when they do give it some thought, they don't know where to begin. Others are so scared by the future, that they need reassurance and encouragement to take baby steps. I'm taking a small risk by going public, I know, but I hope this blog and the few interviews I've given help MORE people to prepare, and at the same time, take away the stigma of "survivalists" and "Y2Kers". The more preppers there are, the safer all of us are, and isn't it quite selfish to keep quiet about all of this if we truly believe that our country is headed for a collapse? And how are you safely storing all the fuel for the generator to run the grain grinder, stove, etc? Seems you'd want manual versions of whatever is available. I think she is putting herself and family at tremendous risk showing all this information to the public. Who do you think hungry people will attack to steal from when that time comes? She has shown her entire stock. I think this is really dumb on her part. There may be far fewer hungry, desperate people because I chose to speak up. Unless a family is LDS or has lived a homesteading life, food storage is a completely foreign world. I speak from experience. Most moms don\’t even realize that they CAN stock up on several months worth of food. OpSec is all fine and good, but the more people in my neighborhood who hear my story, start paying attention to the news, and then taking action will not only make my own family safer but will alleviate the demand on whatever resources may be left. She may have shown herself to the world but she is willing to risk caring for others and their well being then just her own. That is why she would go ahead and show this information. To be honest, it isn't that hard to know where most people are located. But the more people who hear the message, get prepared, and help with the process the less likely we will see another Katrina situation. Great job Lisa and there will always be critics.